There will be plenty of talented players in action when the third-level competition gets underway on Friday. Niamh Collins, Caoimhe Mohan, and Eimear Scally will all be in action this weekend. THERE WILL BE plenty of inter-county stars on display when the Gourmet Food Parlour HEC O’Connor Cup semi-finals get underway this weekend. With reigning champions DCU out of the main competition, we are guaranteed to have new winners in 2019 as the final four contenders prepare to face off on Friday evening in Abbottstown. UCD and UCC are first up to take to the field at the GAA Centre of Excellence for a 3pm throw-in. The second semi-final between UL and Queen’s University will take place later that evening with the two winners progressing to Saturday’s final. 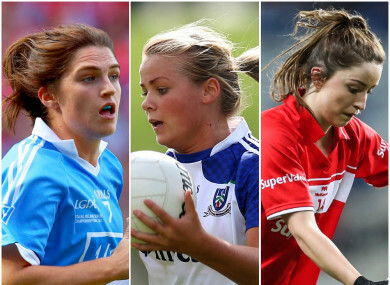 We take a look at some of the top performers that will be on show this weekend, with All-Ireland winners and All-Stars all set to take to the field. UCD are packed with plenty of impressive Dublin players, and in Niamh Collins, they have arguably one of the best defenders in the country. The Foxrock-Cabinteely defender is a core member of the Dublin team who completed back-to-back All-Irelands last year. Unlucky not to pick up an All-Star at the end of 2018, Collins is set to make a major impact for UCD this weekend as they seek to reclaim the O’Connor Cup for the first time since 2016. UCD are also Division 1 champions and will be buoyed by that achievement going into this year’s O’Connor Cup weekend. The deadly forward has years of inter-county football experience behind her although she has not been involved with the Monaghan panel of late. She previously spoke to the SportsGirls Podcast about retiring from inter-county football due to the long commute between Monaghan and Dublin, where she is based. Mohan has All-Ireland final experience as well, picking up an All-Star in 2013 after a narrow defeat to Cork in the final that year. And she will be a bring a huge scoring threat to the UCD attack for their semi-final against UCC. Ward forms one half of Galway’s top twins along with her sister Nicola. The pair came up against each other for the first time in the 2016 O’Connor Cup final between UCD and UL. Louise lost out to Nicola that day when UCD prevailed but she’s back in the final four of the O’Connor Cup this weekend with the Limerick college. The Kilkerrin-Clonberne player sustained a knee injury last year, but she’s back in action and has been featuring well for Galway in their Division 1 campaign. At just 22, the UL captain is a seasoned inter-county forward. She famously scored one of two late goals that steered Cork to an incredible comeback victory in the 2014 All-Ireland final, and made two substitute appearances in the next two deciders where Cork were also victorious. Scally has since developed into a major leader of that team and was part of the UL team that captured the 2017 O’Connor Cup. Scally’s Cork teammate is the UCC captain. An experienced defender, Meaney was also part of the Mourneabbey team who ended a long wait for a senior All-Ireland club title last December. They’re also five-in-a-row county and Munster champions. Her club manager Shane Ronayne is also at the helm with UCC, who are aiming to win the O’Connor Cup for the first time since 2012. Another key member of the Cork squad, Farmer will be a strong scoring option for UCC in their O’Connor Cup semi-final against UCD on Friday. Farmer will be familiar with plenty of the Dublin players lining out for UCD, and she will be able to draw on all that inter-county experience to strengthen UCC’s chances at the weekend. The Monaghan star will captain Queen’s University at this year’s O’Connor Cup. Queen’s won the O’Connor Cup for the first time in their history in 2013, and they face a considerable task in Friday’s semi-final when they take on 2017 champions UL. McAnespie comes from a family with good GAA genes. Her brother Ryan is a star forward for Monaghan, while sisters Aoife and Ciara have also represented the Farney county with distinction. The Tyrone defender has experienced big game days before, after lining out at wing-half in last year’s TG4 All-Ireland intermediate final. Tyrone fired six goals past Meath in Croke Park that day to avenge for the hurt they suffered after losing out to Tipperary in the 2017 All-Ireland final. O’Connor Cup Shield Final: NUI Galway v DCU – DIT Broombridge, 6.30pm. Email “All-Ireland winners and All-Stars - 8 key players to look out for at the O'Connor Cup this weekend”. Feedback on “All-Ireland winners and All-Stars - 8 key players to look out for at the O'Connor Cup this weekend”.